The Elastic Stack is the engine powering critical systems across your organization, business, and team. Keep a pulse on how it's performing to make sure you're getting the very most out of it. Elastic Stack monitoring features provide you visibility into how your Elastic Stack is running. NewStarting in 6.5, monitoring adds support for Elastic APM. Keep a pulse on the health of your Elastic APM deployments alongside everything else. Our monitoring features provide a way to keep a pulse on the performance of Elasticsearch, Kibana, Beats, and Logstash. 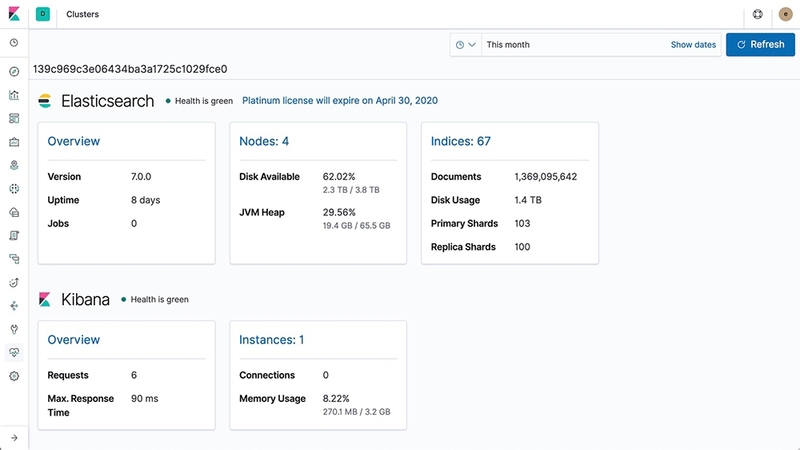 Its collection of dashboards help you assess their status at various levels providing you with all the information you need to keep your Elastic Stack optimized. Bonus: Key monitoring features ship for free. Automatically be notified to changes in your cluster — cluster state, license expiration and other metrics across Elasticsearch, Kibana, and Logstash — using the power of alerting. Simplify your workflow with a centralized monitoring cluster to record, track, and compare the health and performance of multiple Elastic Stack deployments from a single place. The Elastic Stack Monitoring Service gives the Elastic Support team direct access to your historical cluster monitoring data. Created and managed by Elastic support engineers, this service catalyzes a troubleshooting conversation to get to the good stuff faster. It's easy — and kinda fun — to keep your Elastic Stack firing on all cylinders.